Here are the faculty development opportunities for August. Go fully online and earn your Multimedia Master Certification by enrolling in our Multimedia in Blackboard Courses course. 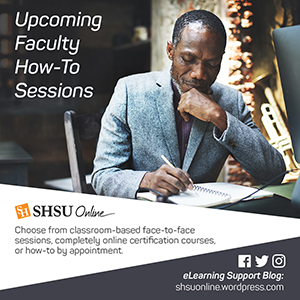 Blackboard Learn: 1st Week Strategies: Studies have shown that the first week of an online course is key for your students. The activities and interactions that take place in that first week can influence the rest of the semester. There are strategies that you can employ that ensure that the start of your course will promote a successful learning journey for you and your students. This one-hour session will outline activities, ideas and strategies you can use during the first week of your course.